Wellington, FL (March 20, 2012) – During her second year in the Young Riders, Canadian rider Mathilde Blais Tetreault and Michelangelo captured the blue in the FEI Young Rider Individual Test at the Palm Beach Dressage Derby CDIW. 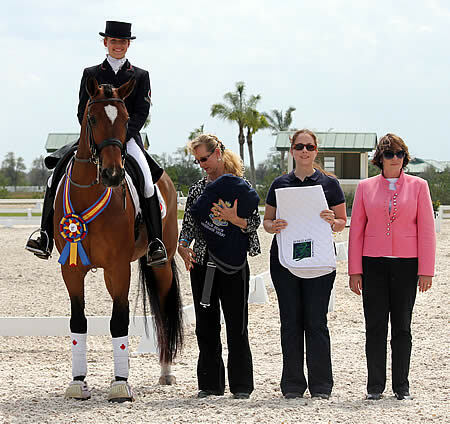 During the prestigious show, Tetreault also won the Everglades Dressage Young Rider Achievement Award sponsored by Everglades Dressage and Bethany Peslar. Tetreault said she was thrilled to win the Young Rider Achievement Award, and was also pleased with Michelangelo’s performance. “My horse was really good in the Young Rider Individual Test. He was very calm and quiet and did everything perfectly,” Tetreault said. The Montreal rider trains with Albrecht Heidemann. As the winner of the Everglades Dressage Young Rider Achievement Award, Tetreault took home a beautiful embroidered saddle pad. Peslar, a popular clinician, is a strong supporter of equestrian programs in the United States. Peslar is a USDF Bronze, Silver and Gold medalist, was the 2006 Reserve Champion in the National Young Adult Grand Prix Championship “Brentina Cup” at Gladstone, and is a successful USEF High Performance Grand Prix competitor. Peslar’s impressive list of accomplishments also includes earning her USDF Gold Medal in 2003 at age 21. For more information on Peslar, visit her website at www.evergladesdressage.com.